Are you looking for a way to grab attention and highlight your business? We offer full-colour, large scale digital printing for indoor and outdoor signage. Need a store-front sign, banner or directional signage? Not only can we help with the printing of these products, but if you’re starting from scratch, we can help bring your vision to life with our in-house design team. Digital printing is one of the best solutions for high-quality, cost effective and timely for large format printing. We use the latest in digital printing technology to ensure that our team can create the most vibrant, professional looking products for your business. 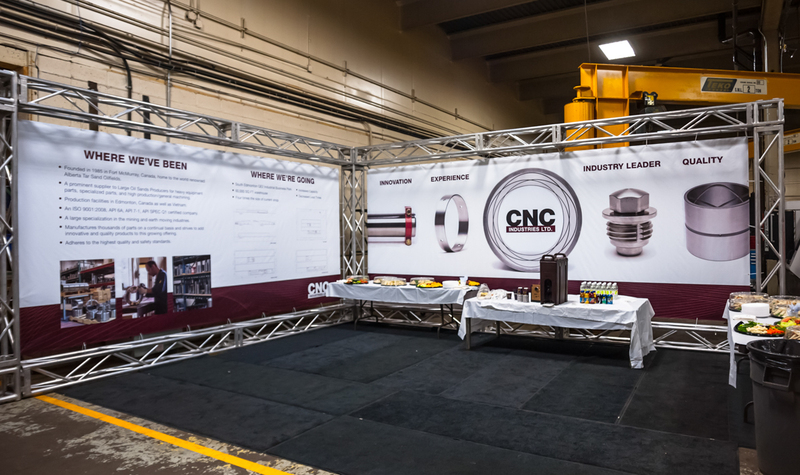 To provide a more industrial feeling for the client’s display, we incorporated the use of industrial truss to make frames for our graphics. Printed on banner material and stretched with grommets to hold the banner tight, these displays really pop. The project included various banners ranging from 8’x10′ to 8′ x 42′ in length.